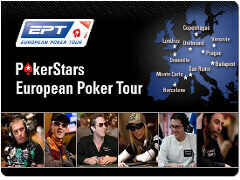 This is the sixth year that a stop in San Remo, Italy has been on the European Poker tour schedule, and since the inaugural event won by Jason Mercier back in 2008, the PokerStars EPT San Remo Main Event has been one of the most popular stops around the world; attracting huge fields and some of the biggest names in the game. This year a total of 797 players registered for the €5,000 tournament, and heading into Day 5 the field has been pared-down to just 24 runners. The remaining players will be back in action on Wednesday as they play-down to the official final table of eight, which will reconvene on Thursday to declare the Season IX EPT San Remo champion. In addition to the above players there are also some well-known poker pros still alive in the tournament including Matt Salsberg, Yevgeniy Timoshenko, and Michael Benvenuti. Wednesday’s action will begin at about 7:30 AM EDT with the players in Level 24, with blinds at 1,200/2,400 and an ante of 300 chips. As the penultimate day of the Main Event gets underway another tournament will be played at the EPT San Remo tournament series, as Day 2 of the €10k High-Roller tournament is also in action. Yesterday a total of 84 players registered for the tournament, and by the end of the night just 45 players remained in contention.